With a sure-to-kill hard freeze, it was time to cook up the pumpkins I’ve had setting outside for Autumn decor. Before I get into that, here’s a picture of the monogrammed pumpkins I grew for my grandsons. After I have my pumpkin cooked and mashed it is ready to use in a multitude of recipes – pumpkin pie, pumpkin bread, pumpkin chocolate chip muffins, pumpkin soup, pumpkin custard, pumpkin pop tarts, pumpkin whoopie pies, pumpkin cookies, pumpkin french toast, and the list can go on and on. Today, I’m prepping for Thanksgiving. I am usually asked to bring dinner rolls to our family gathering, so I made pumpkin dinner rolls. Now before you turn up your nose, let me tell you that there is no pumpkin flavor. However, the rolls are a delightful golden color. 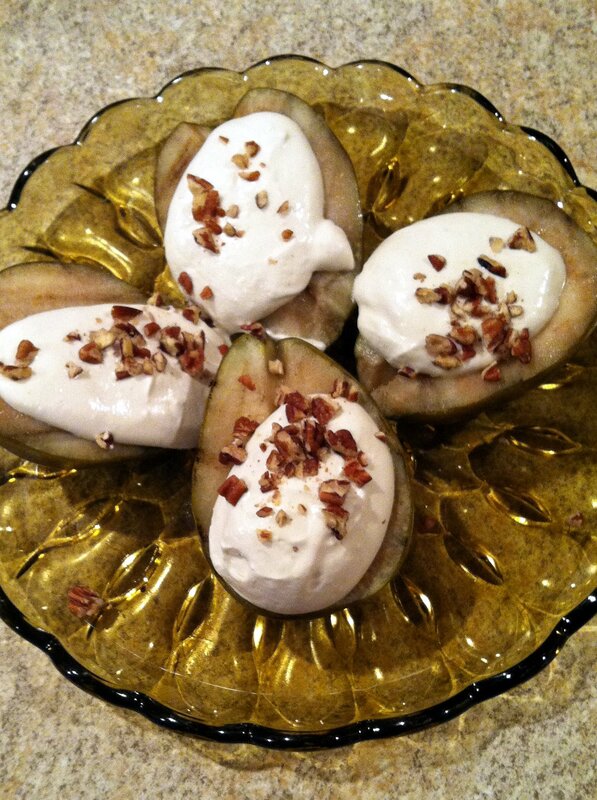 The pumpkin also adds nutritional benefits to the rolls, and can replace half of the fat called for in your recipe. These rolls are moist, light, airy, and most delish when eaten warm with a bit of fresh butter. I admit; I could hardly wait for one to cool enough to sample! I also made pumpkin cinnamon rolls to serve for Thanksgiving Day breakfast. These freeze well, so I’ll thaw at room temperature Wednesday night. 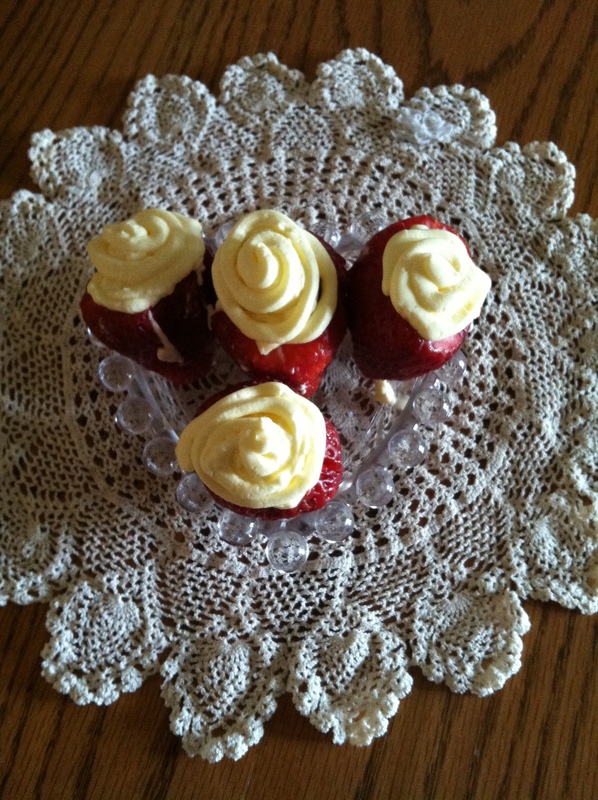 In the morning, I will warm them in the oven while I whip up some cream cheese frosting. It will be a quick and easy breakfast before we hit the road to join friends and family for Thanksgiving dinner. For your enjoyment, here is the Pumpkin Dinner Roll recipe. In large mixing bowl combine salt, whole wheat flour, and yeast. Heat honey, water, milk, butter until very warm. Pour over dry ingredients and mix. Add all purpose flour 1 cup at a time until dough can be handled. Knead on floured board 10 minutes adding flour as needed. Place dough in greased bowl and cover. Let rest 10 minutes. Prepare/grease pans or baking sheets. Form dough into balls and place in pans. Cover and let rise in warm place until double in size (about 30 minutes). Bake 350 for 15-20 minutes. Serve warm. 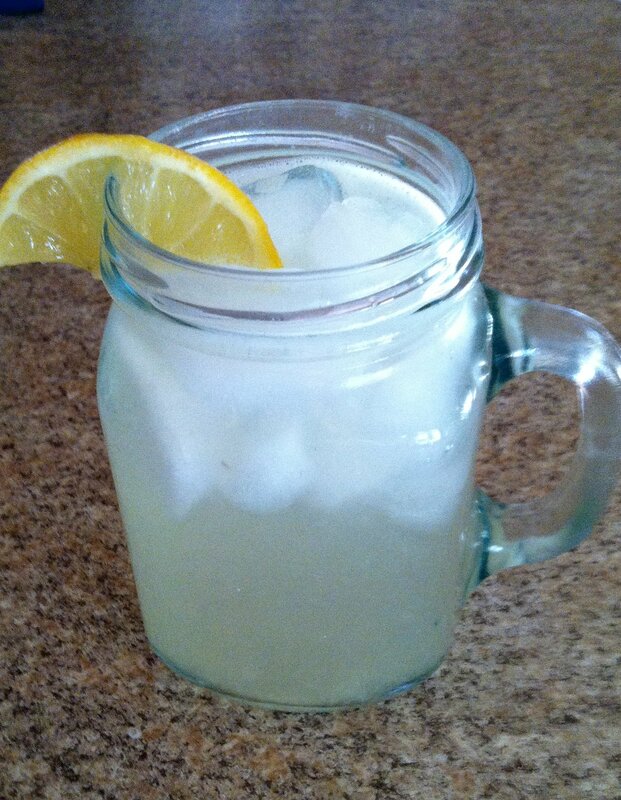 Makes approximately 4 doz. What is your favorite way to eat pumpkin? Oh. My. Deliciousness!!! The aroma is pretty intoxicating as well! However, there is a bread much better than this. Jesus, the Bread of life. I have always appreciated and enjoyed a good, crusty bread, but I am humbled and grateful for Jesus. He gave His life so I may have eternal life. Stir in 3-4 additional cups of flour, one cup at a time. Place in greased bowl, cover, and let rise 15 min. Shape into 2 loaves, and place on greased baking sheet. Make 4-5 slashes across the top. 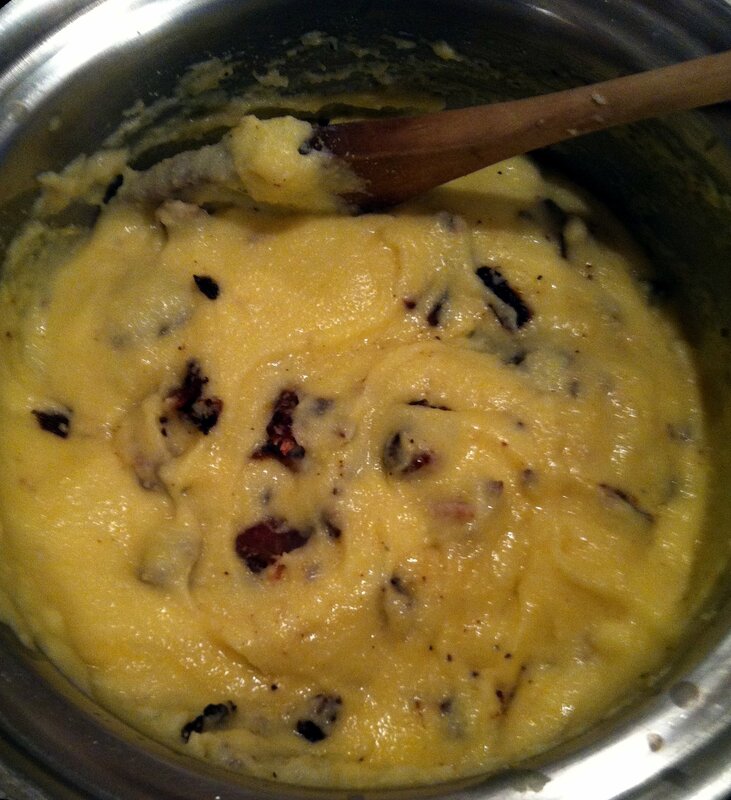 Mix 1 egg and 2 Tlbs milk. Brush on loaves. Bake at 400 for 20 minutes. Hubby brought that trailer load home, and the windows got sorted and stacked neatly in a shed. I immediately knew what OUR project would be. However, farm work and lack of confidence kept us from moving forward. The windows had been stacked, sorted, measured, broken panes replaced, and re-stacked for a year. Finally, Hubby said, “Let’s get started.” So we started. We set all 4 corner support posts, and then it was time to drill wheat. Those 4 posts stood tall like pillars from August to May! Very slowly, when farm work would allow, one window at a time would be attached to frame work. By end of July, we finally had all 4 sides put together. In August, the roof and door were finally in place. I loved the old chipped patina on the reclaimed door, so I lightly sanded and sealed. Eventually, a “U” shaped potting bench was made with just a foot path through the middle of the house. An old door makes a fun shelf for old tins and watering cans, and a hand-me-down chandelier adds a bit of glitz to this one-of-a-kinds greenhouse. 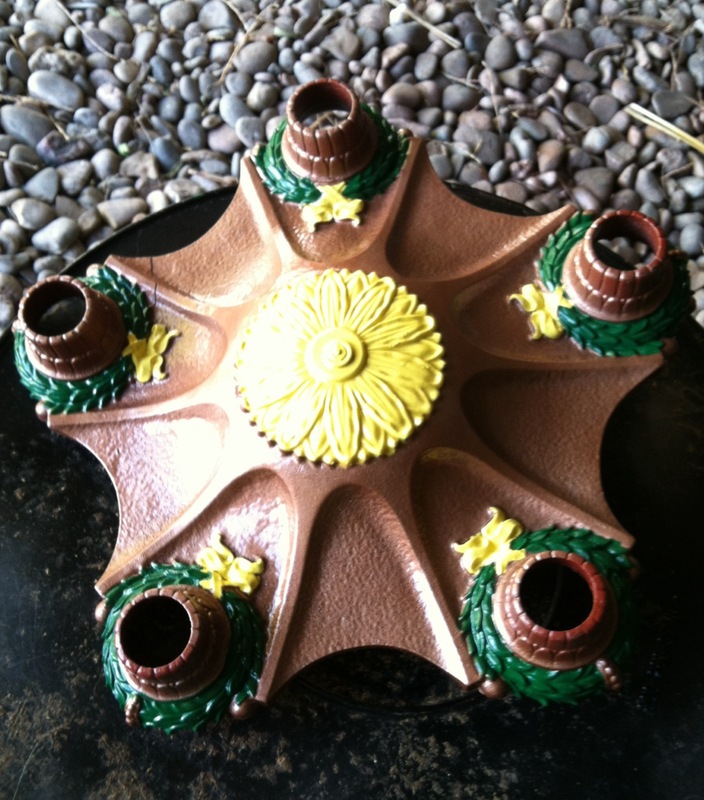 Jose’ the Hose Holder and hanging can with flowers great all who pass by. Our trailer load of windows is now a greenhouse for starting garden seeds, and extending our growing season. What would you do with a trailer of old windows? It’s a show-and-tell kind of day. Warm weather has brought auctions, junkin’, and to-do projects. Read on for a glimpse of what I’ve been up to. In years gone by, women carried a cotton handkerchief in their purse. To beautify these snot rags, colorful prints, lace, or embroidery embellished them. Why would anyone want to buy these old, faded, squares of cloth today? Because there are so many things one can make or do with them! 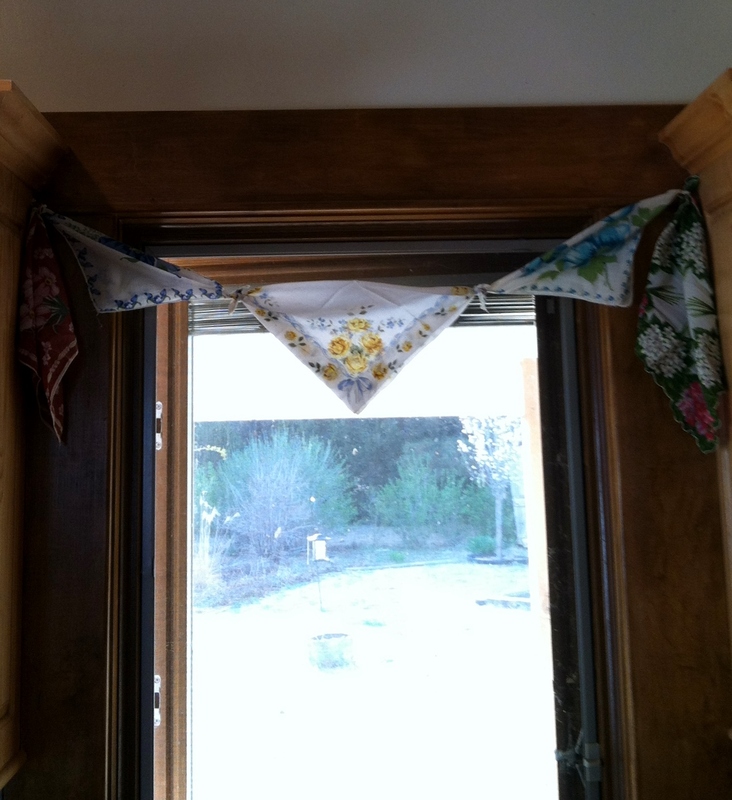 I purchased a box full of hankies at an auction recently, and turned them into spring bunting valances for my kitchen. I simply folded them diagonal to make a triangle. 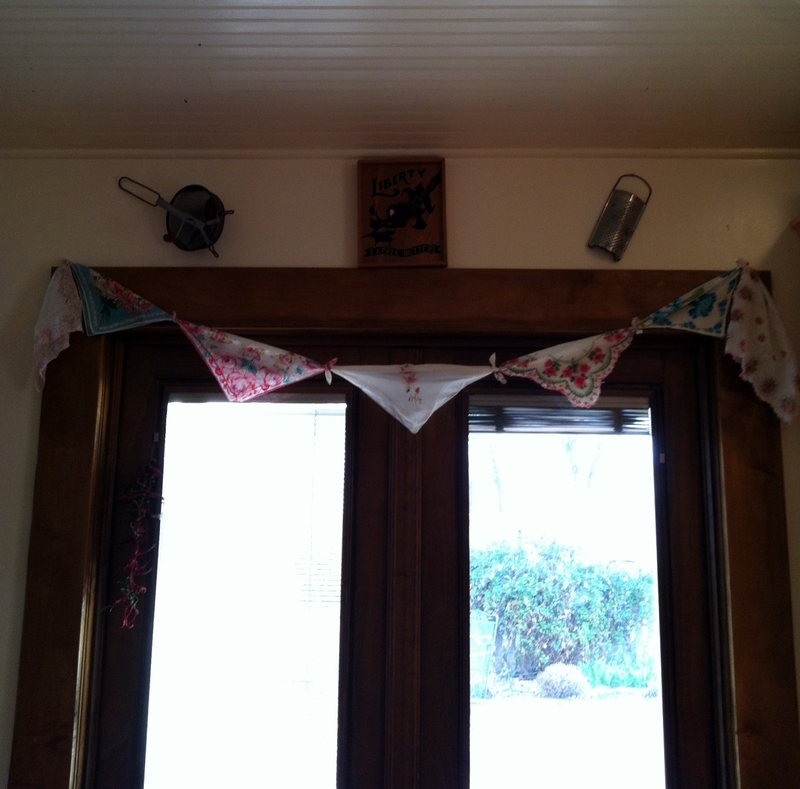 Then tied the ends together, and hung above my patio doors and sink window. This was a quick and simple way to brighten my kitchen. My next project took me outside. 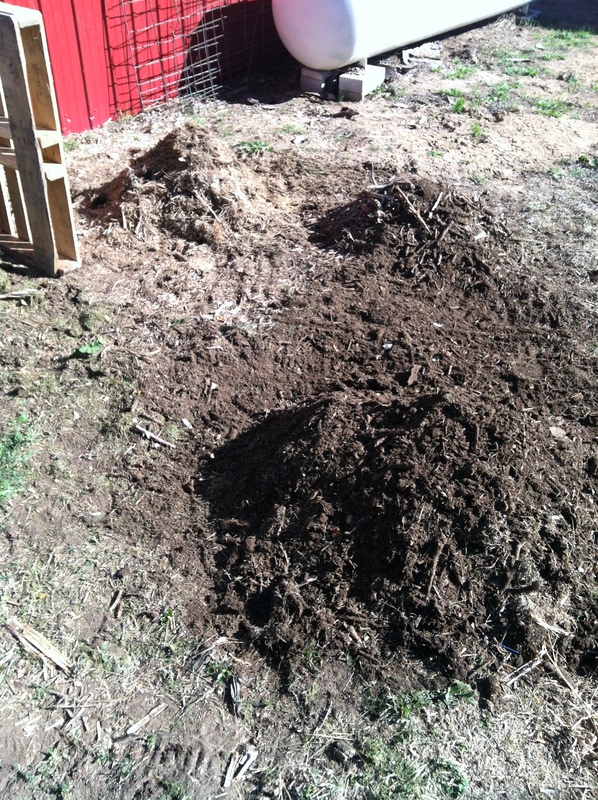 My compost pile has just been in an open spot by the vegetable garden. It was easy to dump and turn. On the other hand, it was an eye sore, and the dog liked to dig through it. 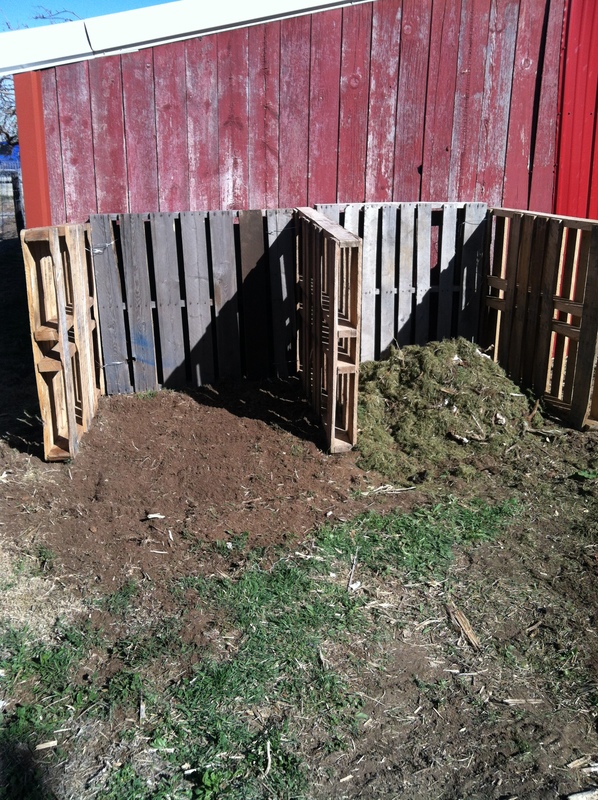 I upgraded to a pallet compost center. My double composter is made of 5 pallets wired together. This is no longer the eye sore it once was. By dividing it in half, I can keep two piles of compost cooking separately. I also found a scrap of woven wire fence the perfect size to use as a gate for the section I’m feeding. This will keep the dog out while still easily accessible for dumping, turning, and loading out the compost. 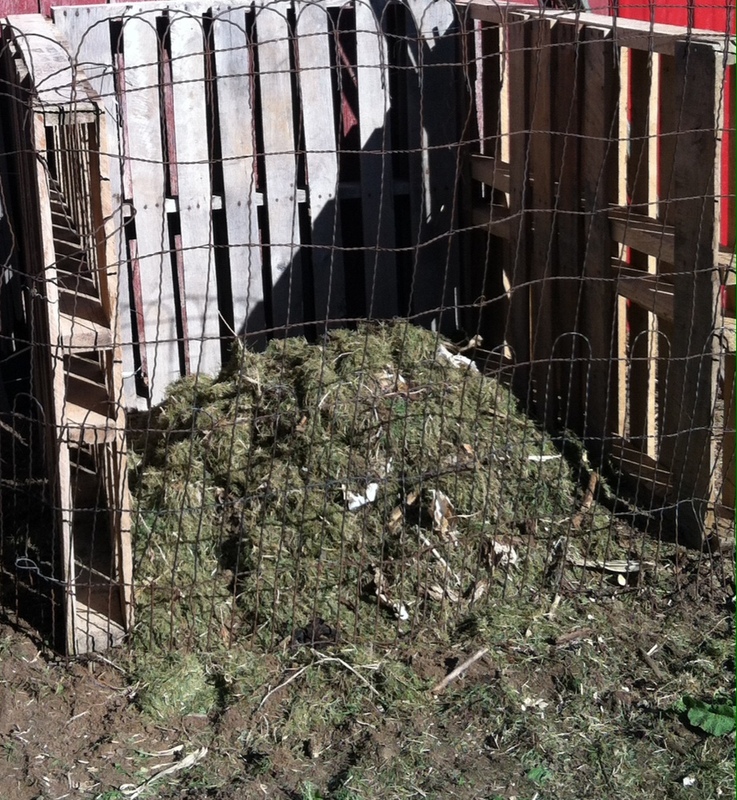 These piles of compost, wood chips, and bamboo mulch are ready to distribute in the landscape. As you can see I have pile of bamboo plus a lot yet to cut. 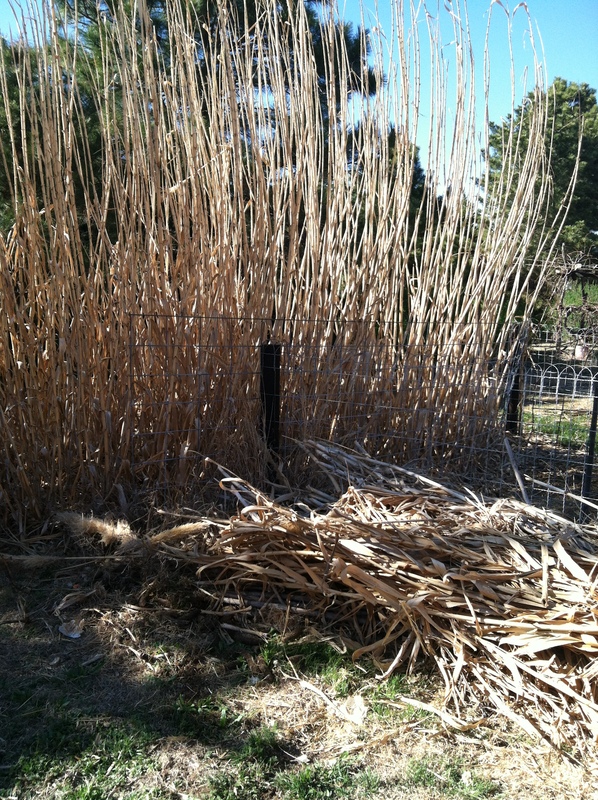 I might add another section to the compost center for the new bamboo mulch. After it is cut I run it through the chipper/shredder, then it is ready to use. This mulch does not break down quickly, so I like to use it around trees and shrubs. We don’t have to be a throw away society. Recycle and upcycle for good stewardship. What projects have you been working on? Feel free to show and tell in the comments! I love being outside. Sunshine and warm temps are like a magnet to me. I’d much rather work, create, play, and relax outside than cook and clean inside. This past month has been busy, busy, busy doing those outdoor things I so enjoy. Today, I thought I’d share some of the projects I’ve recently completed between gardening and lawn mowing. 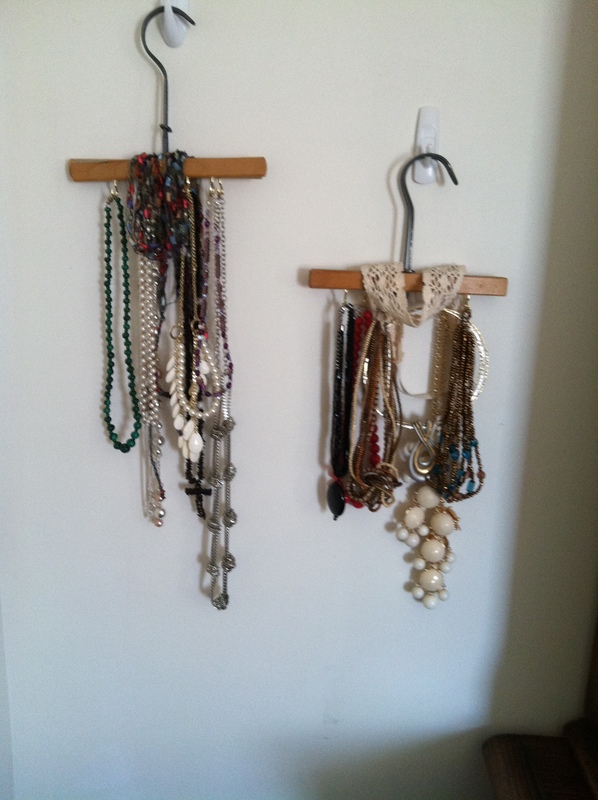 One morning, I turned some old wooden hangers into necklace holders. 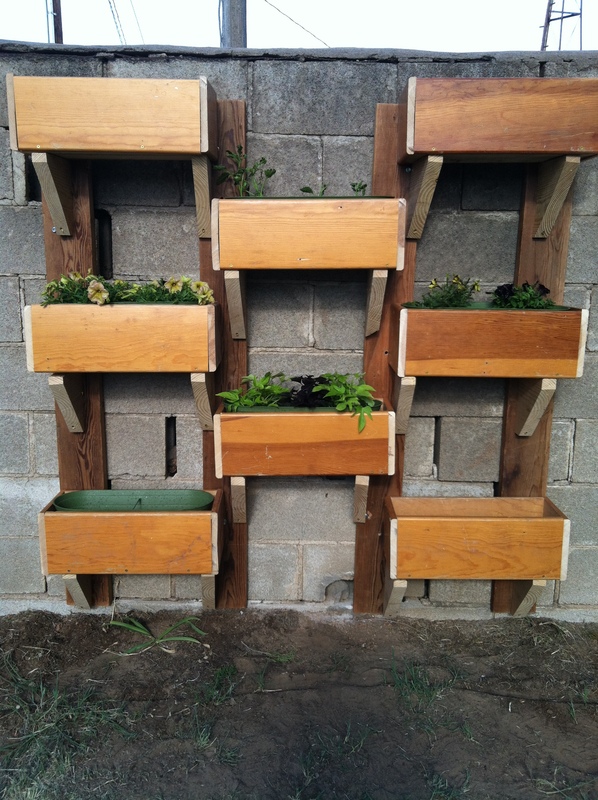 My mom requested a wall of planters to transform an eyesore well house into a focal point. Hubby and I teamed together on this project. We used salvaged lumber we had on hand so the hardware was our only expense. Mom purchased the planter boxes and plants. Our slatted park bench was not safe to sit on. The boards were sagging and rotting, and the iron ends were paint chipped and rusty. We took it apart, repainted the ends, and replaced the boards with some of the old wood floorboards we had left from a house project. 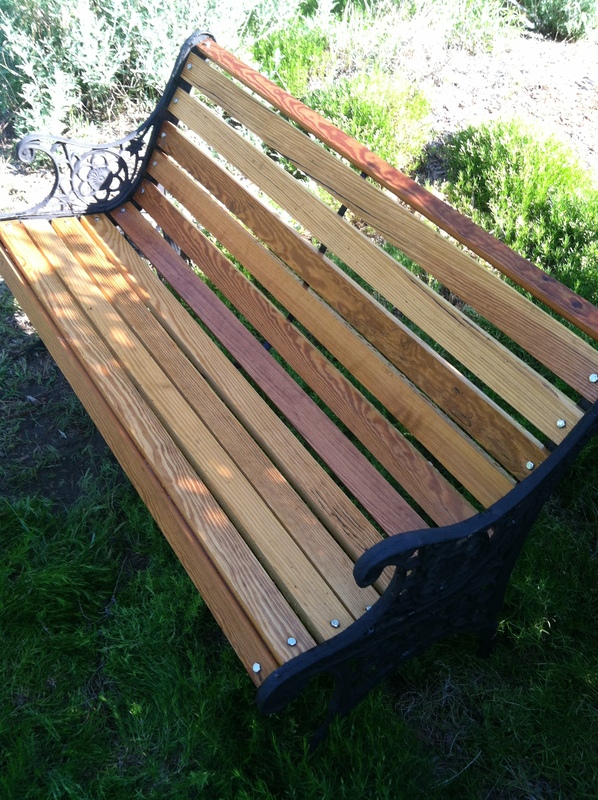 With the boards stained and sealed, I practically have a new sturdy bench. The biggest project so far was completed with my daughter-in-love. 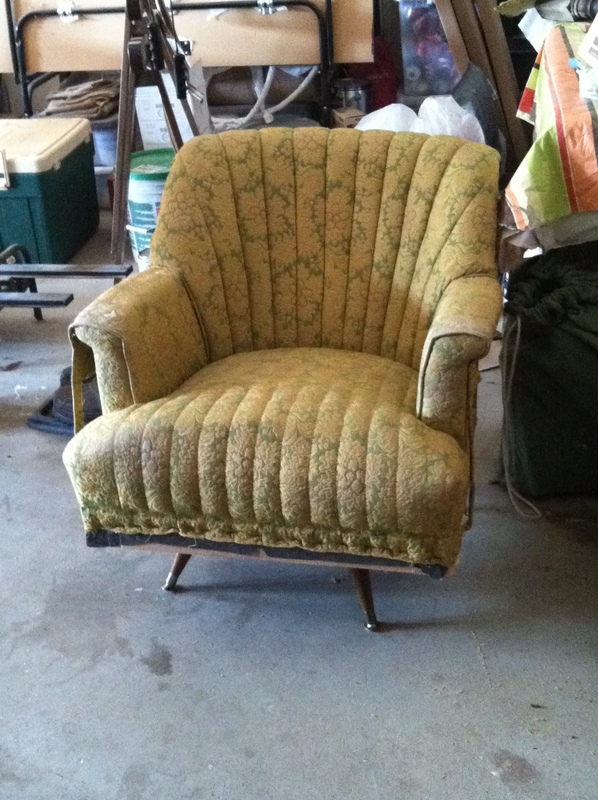 I picked up this vintage swivel rocker for $10 at an auction. The frame was sound, but it needed the springs retied and a complete reupholstering. 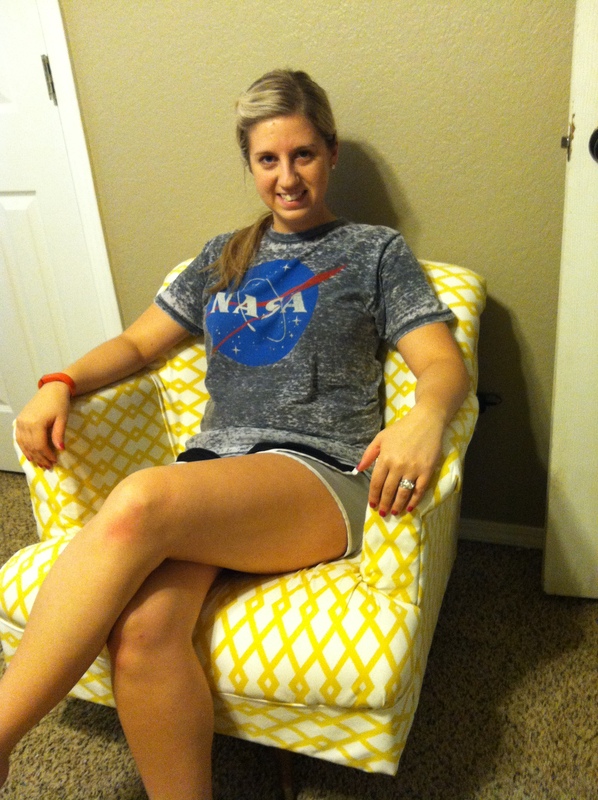 Although we are far from professionals, we had fun working on it, and DIL loves the finished chair. In our country of abundance and shopping ease, we have become a country of waste. However, junking, taking something old and giving it new or renewed purpose, is the rage right now. This is actually something I’ve enjoyed all my adult life. 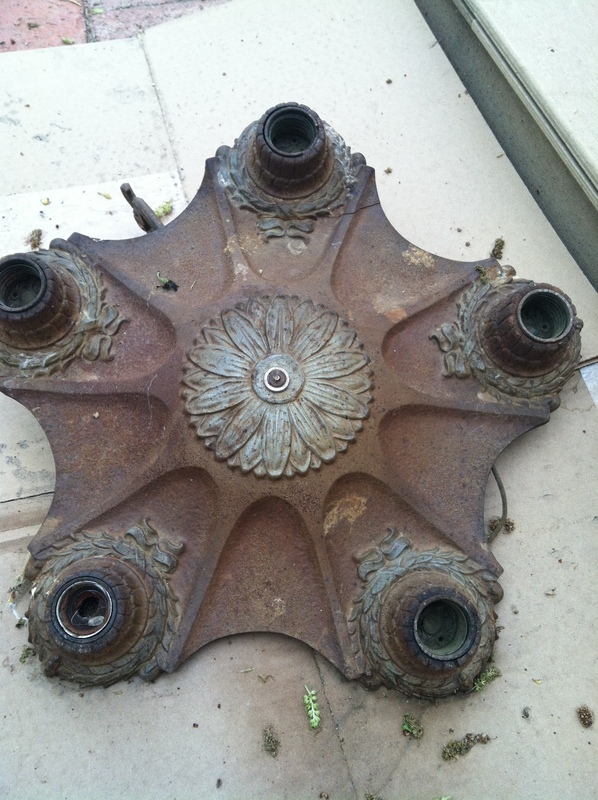 Recently, I scrounged around for treasures in an old dilapidated house on my dad’s property, and found this old chandelier light. Dad laughed when I picked it up and wondered what I’d do with it. My mind was immediately whirling with ideas of turning it into a solar light. 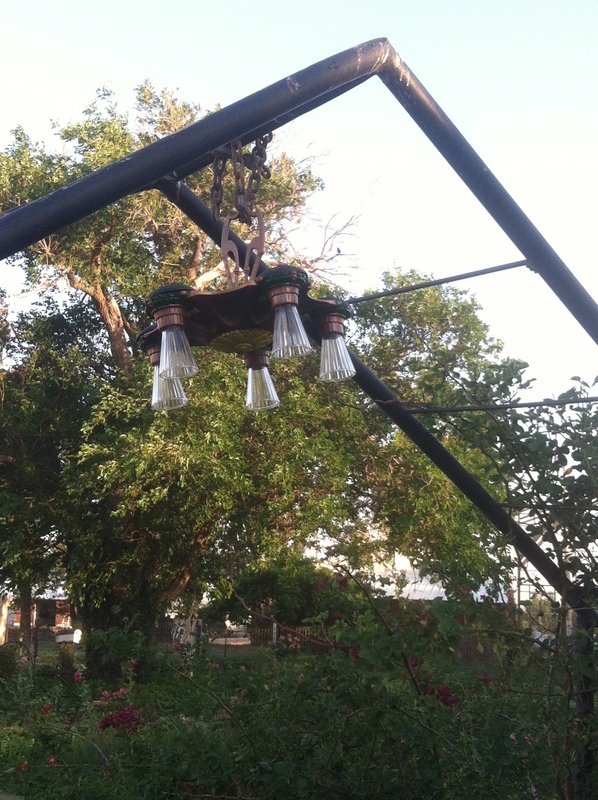 With a bit of paint and some solar lights it is perfect hanging from my rose arbor. The Grands are coming to visit, so Hubby brought more sand to refill the sand box. 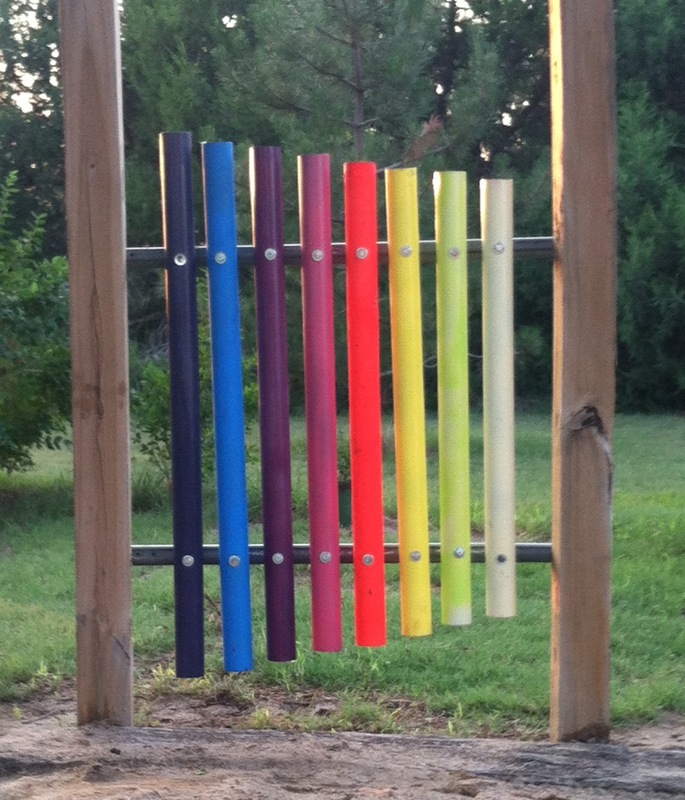 To add a splash of color at the sandbox and a bit of musical play, we made a xylophone from some pipe off the scrap pile. I can hardly wait for the boys to get here! June is past and July has arrived. Garden harvest, canning and freezing will soon dominate my days, but I can think of a few more projects I’d like to complete. As I typed this, I’ve been sipping coffee on the patio and enjoying the oriels flitting back and forth, but my cup is empty, and I really must go clean my house!